The Xfinity XR5 remote control offers streamlined TV viewing experience, making it easy to set up and simple to use. 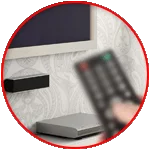 Volume functions can be set to control the TV volume or the volume of an audio device that has been programmed into the remote. This remote control is capable of controlling a cable box that is hidden from sight once it has been paired with the box. All keys on the remote are dedicated to controlling your cable box except for the TV POWER, VOLUME, and MUTE, and INPUT keys. 3. Test the remote to confirm that it controls your TV Power and Volume functions as expected. If it does not, try again using the next code listed. Be sure to point the remote at your equipment during setup. 4. The remote is now paired and the cable box should now respond to any keypress, even when hidden in a cabinet. © 2015-2019 Universal Electronics, All rights reserved.